This morning while sitting on my deck sipping coffee I spotted a possum slipping under my neighbour's fence. It was beige with brown spots. 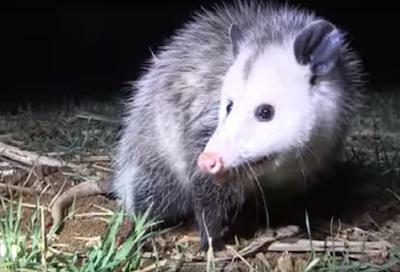 My cat was out, so hoping to avoid any confrontation, I stood up and began to yell at the possum. When I moved forward on my deck I saw another possum, so I grabbed some stones from my garden and hurled them at the possums to scare them off. My concern was their colouration as they were both more beige than brown with brown spots. Does anyone know if the possum population in this area carries rabies? Thank you for sending us this report of your Possum sighting. When I contacted the MNR I was told that Rabies was not a concern with Possums, they are harmless and just like to be left alone. As far as other animals, they are only a danger to horses as their urine can contain a virus which is dangerous to horses. I will also post this on our facebook page so that our facebook followers can also enjoy your post. ps. I found, and added, a picture of a Possum, I hope you like it!